I am amaze that the schooner sailed up the river; I would imagine that the draft would be too much. I agree must have been the Haulover settlement as the sea is in the background. Or it might be closer by Southern Foreshore. I remember the latrines over the river. They were still there in the 1970's. I count 4 in the picture! Many photos of old Belize were black and white and then colored. 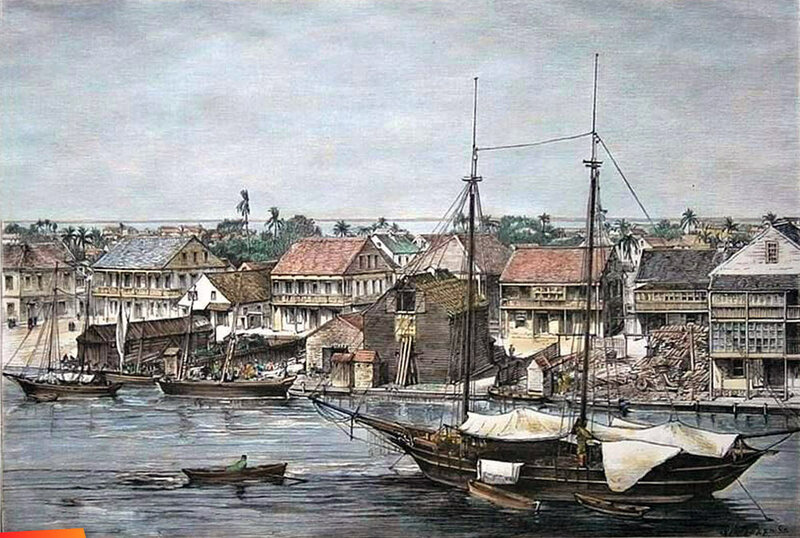 In 1809 , photography did not exist so this is a painting, or it is from a later period. Beautiful though. To record this, the perspective was done not at ground level but from some elevation that you were able to see the sea and mangrove island in the background . Hmmm, I get the feeling this is the North Side and that North Front Street is between the front buildings and those in the background. That would mean the Market location is behind us as we look. It would be nice to know the name of the Schooner and who owned it. My ancestors, the Ushers had a Boat (Schooner) that was used to travel the Shores and bring back goods to Belize - one was named Juba and another was The James.